These meticulously designed Painted Lady life cycle figures are an educational accessory to any of the life butterfly kits. The accurately detailed Egg, Caterpillar, Chrysalis, and Adult Butterfly replicas are over-sized which makes them perfect for little hands. Ages 4 & up. 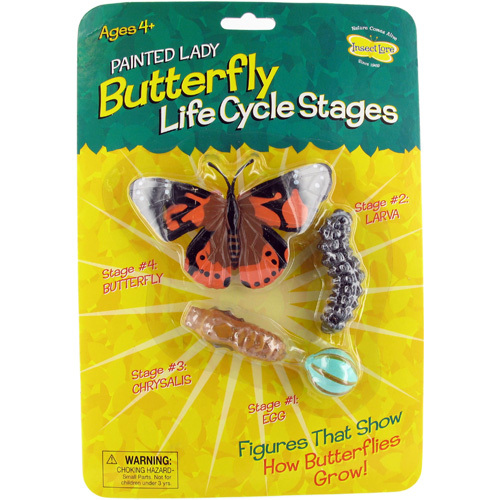 These meticulously designed Painted Lady life cycle figures are an educational accessory to any of the life butterfly kits. The accurately detailed Egg, Caterpillar, Chrysalis, and Adult Butterfly replicas are over-sized which makes them perfect for little hands.